In the 1970's, Canadian National & Canadian Pacific developed a concept for a standard 4550 cubic-foot 4-bay cylindrical hopper. The basic design of this hopper was developed into two car types, one for grain and similar consistency products and another for potash, dry chemicals and fertilizers. The most obvious difference between these two types of cars can be seen in the loading hatches on the top of the cars. The grain version of the car has trough hatches spanning the length of the body top, while the potash version has a series of round hatches spaced along the length of the body. During the production life of the design, thousands of these care were manufactured in various production runs by three different manufacturers. Hawker Siddeley produced many of these cars over the production run, and in total produced 15 variations of the basic design between the grain and potash types of this car. Today, thousands of these cars remain in service with Canadian Pacific, Canadian National and a number of other operators. 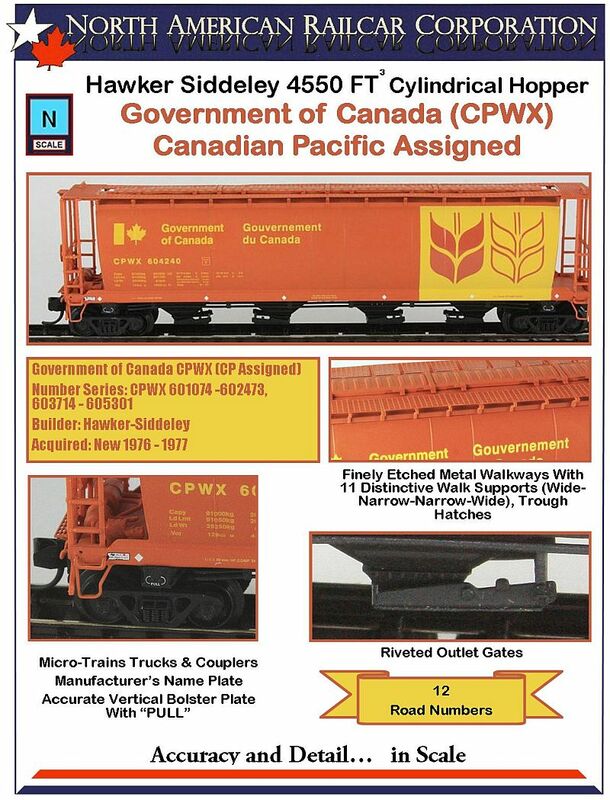 Many can be seen in their original "Heritage" paint schemes, as well as more modern schemes, such as the colorful 2008 Green Saskatchewan Grain Car Corporation scheme. Though they initially were primarily seen in Canada, they now travel the rails of North American from Canada to Mexico, with operations in many parts of the United States. see the car in "3D Click & Spin"
You will need "Quick Time 7" to view it. Click here to download QT7, it is free. The 3D image may take up to 60 second to fully down load, then drag your mouse across the hopper. Published with permission of Moder Railroader. 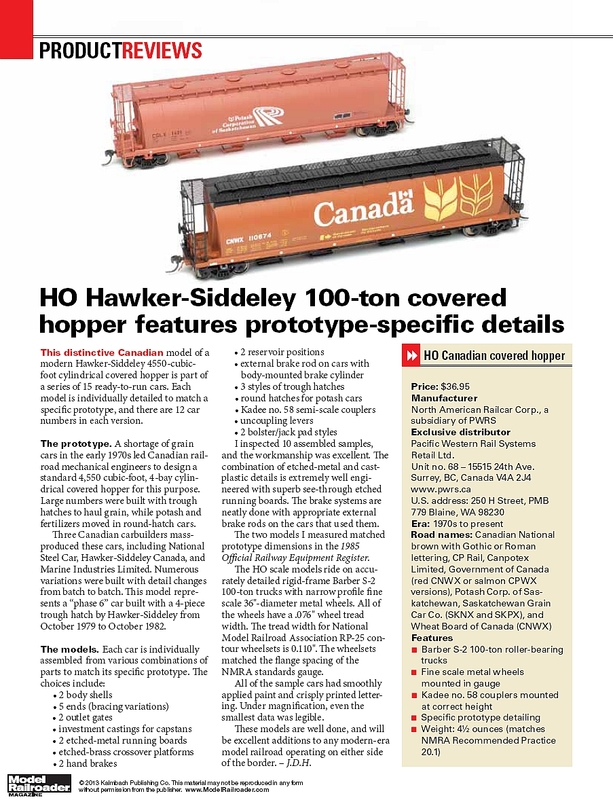 For a complete list of all the different versions and explanations of the differences on the Hawker Siddeley 4550 cu ft Cylindrical Hopper go to this link: Click Here.